Mar. 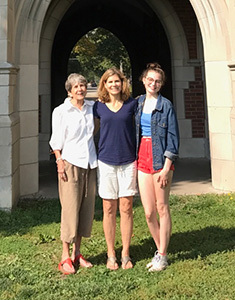 16, 2018 — When Sophia Schott ’21 arrived in Grinnell last fall, she became the ninth member of her family to attend Grinnell College, spanning four generations and nearly a century. To find out what makes the College memorable and what has inspired family members to give back, we separately asked Carolyn Toft ’58, Jessica Toft ’89, and Schott a series of similar questions. Carolyn is Jessica’s mother and Jessica is Sophia’s mother. What transpired was a fascinating look at how three generations view the College and giving. Q: Why did you decided to attend Grinnell? Carolyn: My mother, Elma Hewes ’28, went to Grinnell College, which wasn’t necessarily an incentive; it was the opposite. I applied to Carleton and Grinnell and got the same financial package at both. But Carleton seemed scary, mostly because of the tunnels, which meant lots of snow. I spoke to a friend who went to Grinnell who told me it was a great place, so I decided to go here. Jessica: When looking around at colleges, I only applied to Carleton and Grinnell. Both of my parents (Carolyn and Daniel Toft ’57) went to Grinnell College and my grandmother did as well. Having been on campus before, I was familiar with parts of the College, including the music program. Carleton had some fascination, but Grinnell accepted me first and that made the difference. Sophia: I never thought I would attend Grinnell. I didn’t think of myself as someone who would follow in the family footsteps, and I was never pressured to choose Grinnell. It just ended up being a perfect fit for me. I love the open curriculum, the small class sizes, and the school’s emphasis on social justice. It’s also just 56 minutes away from my grandma’s house, so I feel I can be independent while never being too far from family. Q: Why do you give back to Grinnell? Do you know what caused other family members to do so? Carolyn: It was a family tradition. My mother gave financially to the extent possible when working and married. She left a planned gift as well. I’m continuing the giving tradition. And having classmates who are still involved with the College and giving provides group inspiration. Jessica: I took advantage of many opportunities: basketball, volleyball, research assistant, Collegium Musicum, and Grinnell Singers. I had a chance to explore possibilities and be involved socially. That’s a remarkable education, and I haven’t even yet mentioned the social justice aspect — an emphasis on the value of humanity. I give to Grinnell because it is important to keep social justice as part of the identity of Grinnell College. For my parents, Grinnell College was such a fostering place to receive a liberal arts education. It really instituted in them an understanding of the world and a desire to do good in the world. That was passed on to me. Sophia: My parents and grandparents feel a strong connection to Grinnell. They met coaches, mentors, lifelong friends, and their spouses through Grinnell. They also really believe in the College’s financial aid mission. Grinnell made it possible for my dad, Max Schott ’90, to afford college while his father was putting himself through law school. My dad always has been very grateful to the College and wants to make sure the College can continue to help students of all income levels attend. Q: Do you and your family members have other common interests? Carolyn: We share an interest and ability in music. I was a music major though Jessica wasn’t. The most common thread is social justice and activism. This may go back to my mother. Jessica: Music is a link. My father sang in the Scarleteers (a male vocal octet) and my mom was the accompanist. They wrote a song called “Grinnell Parents” that was performed at parent’s weekend. I was involved in choirs, and my daughter wrote a musical in high school that they put on. History is another link. My dad is a history professor, my mom is a historic preservationist, and I teach the history of social welfare at the University of St. Thomas in St Paul. Sophia: I am interested in majoring in music composition and possibly sociology or Spanish. Music has always been an important part of my family’s Grinnell experience. I am a member of Grinnell Singers and the acapella group, Con Brio. I was in a musical last semester, and I am playing the piano for the musical improv group, Neverland. I am also on an improv team. Q: How does the fact that other family members also give back to Grinnell make you feel? Carolyn: I’m very pleased, of course. I’m even more pleased that we are giving back in non-financial ways as well. Having Sophia at Grinnell College continues the tradition of our presence here, and she will continue the tradition of donating as well I expect. President Kington has made an impression on me, and because of that I am considering further contributions. The direction he’s taken the College and its commitment to diversity seem critical to the future of the school. Jessica: It feels like a family tradition, and that we are supporting an intellectual endeavor for the betterment of society. It’s important to be well educated and to make intelligent, well-informed, ethical decisions in the larger world. By giving to Grinnell College, we support this way of being in the world. Sophia: It makes me feel like I’m in the right place. The fact that they still feel connected to their college decades after graduating speaks to Grinnell’s importance in their lives. They received great educations here. I’m glad they’re helping to make it possible for others to do the same. Q: Did your family history of giving influence your own decision to give? Carolyn: No, my decision to give is based on my experience and my contemporaries’ recent experiences with the College. It helps that it’s easy for me to get to campus. Having a physical presence is important. Jessica: Certainly. My mom continues to give, and my dad raised money for the Sue Berne ’58 memorial near the science building. To have a physical structure erected made an impression on me. My parents care about this, and I care about what they believe in. Q: What advice can you offer other parents of Grinnell alumni about maintaining a culture of giving across generations? Carolyn: Be involved in the College beyond just Reunion. The College has great music programs, speakers and fine arts – and there are other compelling things that draw people to Grinnell. I think it’s important to experience the physical space and place it in a context and not just have it be a mythical college in the prairie. Jessica: I would say pay it forward. I want to make my amazing college experience available to all kinds of people. Sophia: In terms of looking at this from the children’s point of view, I would encourage them to come visit. I was skeptical of Grinnell’s small town location at first, but I’ve found that there’s so much to do on campus. It’s also so interesting to hear about how Grinnell has changed over the years. Ask your parents about their experiences. Q: Do you think there’s a chance any other members of your family will attend Grinnell in the future? Jessica: I have a freshman in high school; we’ll see how the chips fall. Sophia: I think my sister is looking for a different college experience. But with such strong family ties to the school, it would not surprise me if one of my own children end up going. No pressure, of course! The Hewes/Toft/Schott family gives to Grinnell College for a variety of reasons. We invite you to learn more about why giving matters.